Two pilots have appeared in court after being arrested at Glasgow Airport on suspicion of being impaired through alcohol. Captain Jean-Francois Perreault, aged 39, and Imran Zafar Syed, who is 37, were remanded in custody. They were arrested at the airport on Monday on suspicion of being under the influence of alcohol. 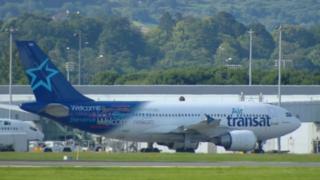 The Canadian pair were due to fly a Canada-bound Air Transat plane with 345 passengers and nine crew on board. The flight was held up overnight and eventually lifted off at 10:30 on Tuesday. Air Transat apologised to those customers affected and offered passengers compensation of 200 Canadian dollars off their next flight as a "goodwill gesture". In a letter it said: "Please accept our sincere apologies for the disruption caused by the delay of your flight. While it is our policy to do everything within our power to ensure on-time performance, regrettably, this is not always the possible." The company said the safety of its crews and passengers was its top priority and that it would await the results of court proceedings before commenting further. The delayed flight took off from Glasgow just after 10:30 on Tuesday. The pilots were arrested under section 93 of the Act. It focuses on the limit of any alcohol consumption and says it is an offence to perform or prepare to perform certain aviation-related functions with more than a prescribed level of alcohol in the body. That limit is set at 20 milligrammes of alcohol per 100 millilitres of blood for those activities carried out by aircrew and air traffic controllers. In the case of breath, nine microgrammes of alcohol in 100 millilitres are allowed and in urine the limit is 27 milligrammes of alcohol in 100 millilitres. The drink-drive limit in Scotland is more than twice the blood limit, which currently stands at 50mg in 100ml and reflects the speed of reaction needed by aircrew and air traffic controllers to respond to potential emergency situations. Aviation functions can be defined as acting as a pilot during a flight, acting as navigator of an aircraft or as a flight radio-telephony operator during a flight, as well as acting as a member of the cabin crew. Anyone convicted of committing an offence under the act can face up to two years in prison or a fine or both. Some of the passengers checking in at Glasgow Airport said they were angry at the way they had been treated by the airline and by the lack of information from staff. One man told BBC Scotland's Good Morning Scotland programme: "There is some compensation, money for flying, but I don't think that will be acceptable for anyone who's been inconvenienced for the whole day." 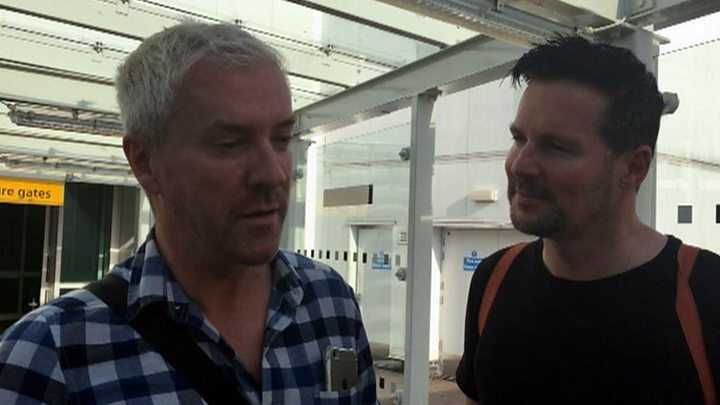 Glasgow-based TV presenters and interior designers, Colin McAllister and Justin Ryan, were due to be on the flight. They explained that passengers had been told the plane could not take off due to "operational reasons". Mr Ryan, who along with Mr McAllister presents a TV show in Canada, said it was a "real hassle" that their flight had been delayed "first by a couple of hours, then by 21 hours, and then cancelled". He added: "That flight for us is essentially our shuttle to work, we come backwards and forwards to Glasgow maybe 20 times, 30 times a year. "It is one of those things, we have had a lot of really good experiences and one really awful one in light of what has allegedly happened."